Tasman Butchers is a large format butcher with over thirty years of experience providing the best meat at the best price. With 9 stores conveniently located across metropolitan Melbourne, we pride ourselves on the freshness, quality, range and value for money that our products provide. Our meat is 100% Australian grown and is primarily sourced from the lush pastures of Victoria. All meat is delivered fresh daily to our stores where it is prepared and packed on site. We carry a full range of quality yearling beef, choice cuts of lamb, full range of pork, chicken and other poultry lines as well as game and veal. We also sell bulk meat including full cryovac pieces. If you are planning a function or a barbecue be sure to visit any one of our stores, where we will be able to assist you with your requirements. We can make product recommendations as well as cater for special orders. All of our stores offer complimentary services such as slicing, cutting and trimming to your requirements. Tasman Butchers carries a wide selection of grocery, frozen and deli products and a range of Italian products that we have imported exclusively. 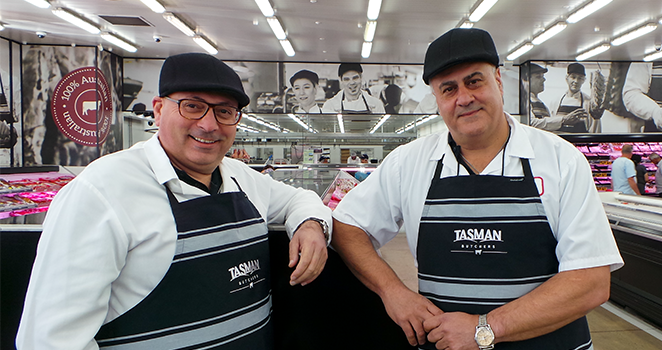 Be sure to visit your nearest Tasman store to enjoy our value, range, quality and service. You won't be disappointed!